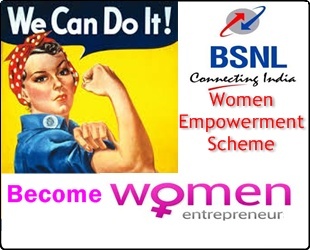 Telecom Public-Sector-Unit in India Bharat Sanchar Nigam Limited (BSNL) has announced to launch Women Empowerment Scheme across India to widen its services. According to BSNL Official sources, under this scheme BSNL will appoint Women Direct Selling Agents, Women Rural Distributor, Women Retailers to promote various Telecom Products of BSNL which covers rural areas as well Urban segment of the society on Pan India basis. BSNL moved a unique step of women empowerment rural, urban segment women to turn Women into small Entrepreneur or to become a part of distribution channel of BSNL Services. The BSNL Competent Authority decided to gain more share market by selling of all BSNL Telecom products through empowerment women agents which help to reach door to door will improve BSNL Revenue to turn women into small Entrepreneur. Being Public Sector Unit and part of Social Development BSNL indirectly recruiting more Un-Employed Women agents empowering them to distribute Telecom Products will help them increase their income and financial wellness.